May 20, 2019, 12:15 – 1:00 p.m.
Mission Matters makes direct links to external contemporary realities and the need for museums to better position themselves as leaders and change agents in the greater landscape and diversity of people of our times. Features include thought essays by David Fleming from the UK who tackles the importance of mission and social issues, and Charmaine Jefferson who frames the complexities of cultural competence in the 21st century. Twenty museum leaders each share their institution’s story of transformative change tied to reframing their mission. 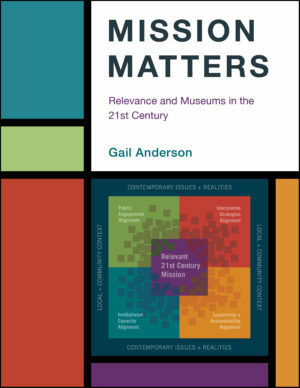 Anderson’s central tool for the book, the Mission Alignment Framework, helps reference the thinking about missions and the subsequent changes within museums as they redirect their work. Eighty US and international mission statements reveal the range of museums from urban and rural to different types of museums, styles of mission all illustrating relevance in a way unique to their location, institutional capacity, resources, and purpose. Complementing these examples are: guidelines about how to rethink mission; a questioning strategy based on the Mission Alignment Framework; and, a range of useful tools from museums and leading thinkers in the field. American Association of Museums Conference 2016, Washington, D.C.
Moderator: Workplace Culture Matters, an exploration of the important relationship between a museum’s internal values and its external offerings and the ways that meaningful investments in a values-based culture lead to tangible results. In conjunction with the release of the new edition of her book Reinventing the Museum: Historical and Contemporary Perspectives on the Paradigm Shift, Gail Anderson presented a lecture for the Jordan Schnitzer Museum of Art’s Museum Studies program.